Bought a 16.5" barrel to get the best accuracy possible out of my custom 10/22, the only thing left of the original gun is the receiver and bolt. My hunting partner wants me to order a barrel for him because mine is "minute of squirrel eye" at any distant up to 100 yards. A lot of shots are at 45-65 yards with a target area the size of a quarter at best. This was one of the wisest purchases that I have made. Bought this barrel and it's worth every penny! I get .3 to .5 groups. Install note: my barrel was going to be a tight fit but a simple step can make things much easier.. I placed the receiver outside in the sun to warm it up and placed the barrel in the freezer for about an hour.... then the Barrel installed with ease. Purchase and enjoy! WOW...can't wait to see what this does after it's broken in. After sighting in the gun with 40 rounds I put up a new target and placed 20 rounds of CCI Mini Mags into a dime sized hole at 50 yards! Barrel was a real tight fit going into the receiver even after freezing for a couple hours and applying some anti-seize. After many strikes with a rubber mallet to the receiver it finally seated perfectly. This barrel out shoots my other competition match grade barrel on other 10/22 that I own. I give it five stars. .24" groups at 40 yrds. This Kidd barrel I have will shoot SK Pistol Match exceptionally well. About a week ago in windy 10-20mph winds I shot a 5 shot group T 50yds with this ammo that measured .130ctc. A BIC ink pen almost covers all 5 shots. I shot another one that day that measured .175ctc. I strongly recommend this KIDD barrel to anyone who wants exceptional accuracy. It's been an amazing experience building a rifle with this barrel With the first few 25 round mags, I made sure the action all worked and the scope reasonably sighted in. After that, I let my son go through more than a handful of 50rnd 22LR boxes, several hundred rounds. He gave it back to me after all that. Somewhere along the way, the accuracy and repeatability settled it. Amazing! Too lazy to call "Cold" at the range to change target papers, I decided to shoot out all the targets my son had been on. I found that it was so accurate I can shoot out the staples used to post targets. 5 shots at 3 staples, and the paper target dropped to the ground. Then another and another... 50 yards out and I can hit a staple when I wanted to (1.5 lbs trigger). All Kidd parts except for the polymer trigger housing. Thx for such an awesome experience. Just got back from the range to shoot my custom 10/22. I had a Kidd Match Bull Barrel and Bolt.....no misfires and the shot groups were great. Zeroed out to 100 yards and AWESOME. 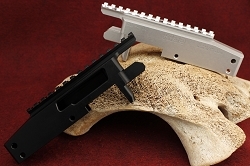 Q: I am using a AATS1022 Deluxe Target Stock that comes with a barrel tensioner block. Should I install this or I let the barrel free float? Q: Does the muzzle break add length to the barrel? For example, a 20" barrel becomes 22" with the muzzle break. Q: Will your barrel fit on a take down ruger or should I just get a standard 10/22? 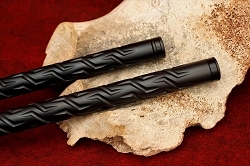 Q: Do you make this barrel in black? Also how does the threading affect the accuracy. I plan to purchase all Kidd parts to build a 10/22 rifle using a Revolution Yukon stock. I want this to be as accurate as possible but would also like to include some "cool" into it. 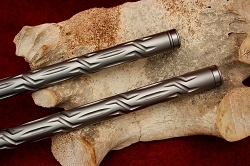 Q: I was wondering if I can get the match grade ss barrel threaded *in black* color and not ss. I'm going with a black on wood look and want to match the suppressor I'll have on if. Any way you can finish this as your other barrels in black? A: Hi Eric, Thank you for your interest. 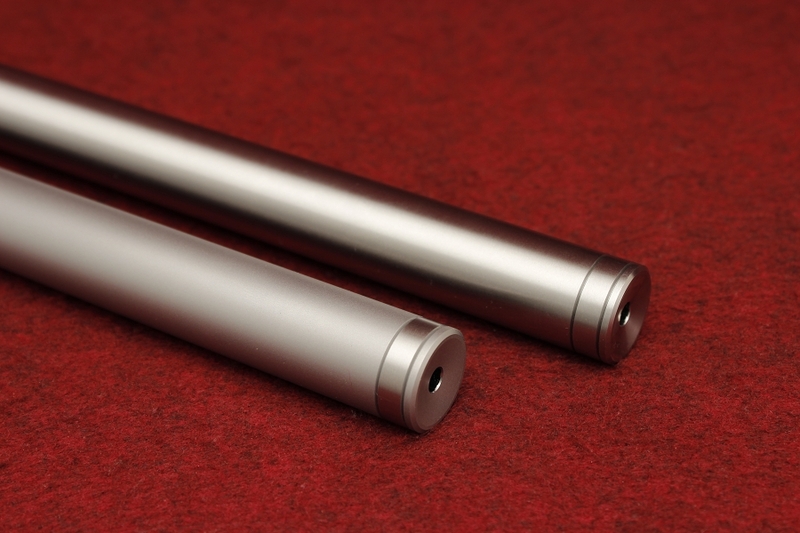 We offer a chromoly barrel now that is blued. 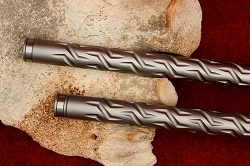 Here is the link: http://www.coolguyguns.com/KIDD-22LR-Black-Bull-Barrel_p_24.html. Q: Will this barrel fit in the original stock? Q: Is there any way you guys could install some type of open sights to any of your barrels? Q: i need to know the barrel diameter? Q: When ordering this barrel if I select the option of the muzzle brake will the basic thread protector also be included? Also what method do you use for installing your muzzle brake, crush washer, peel washer or shim washers? Thank you. A: You will get the cap and the muzzle brake when you purchase a threaded barrel plus the muzzle brake option. The brake will screw on without any shims or washers. Q: Does the barrel mate to the Ruger 10/22 stock or do you have to purchase after market stock? 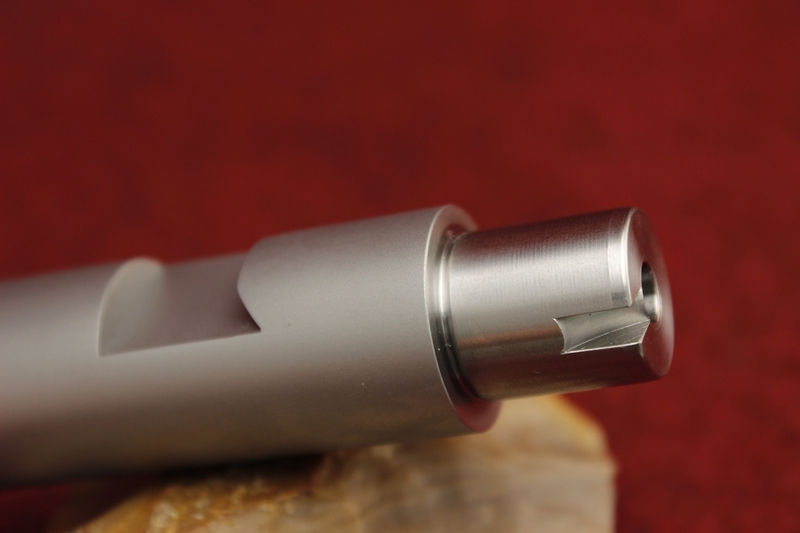 A: All of our barrels require a .920 bull barrel channel in the stock in order to drop in.